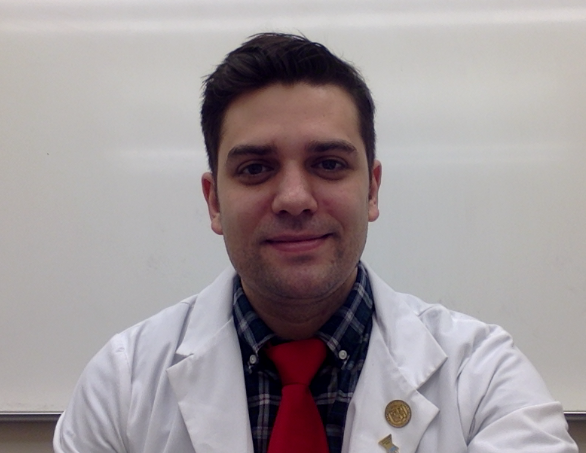 Meet Chris Verdi, Our Second Year Pharmacy Student at Karl Road. Chris Verdi is our second year pharmacy student at Happy Druggist on Karl Road in Columbus. We’d like to introduce you to Chris and hope you will stop in the store and make him feel very welcome. Hi- My name is Chris Verdi. I am a second-year pharmacy student at The Ohio State University’s College of Pharmacy. In addition to my PharmD coursework, I am pursuing additional education in the field of Gerontology. I believe it is important, no matter what specialty field I end up in, that I learn how to best care for our aging population. My career goals include becoming a residency trained pharmacist specializing in a care field. My current interests are in cardiology, specifically the treatment of heart failure and arrhythmias, and infectious disease, including combating infections, preventing hospital acquired infections, and promoting antimicrobial stewardship. I am also interested in the evolving role of pharmacists in critical care settings. Outside of the world of pharmacy, I’m a big Cleveland sports fan. I love reading and spending time with my wife and two dogs. Please stop by the pharmacy and chat with me. I would love the opportunity to get to know our patients better! Meet Tom Kellett, Our First Year Pharmacy Student at Plain City Druggist. We’d like to introduce everyone to Tom Kellett, although we think many of you may already know him, as he is from Plain City. 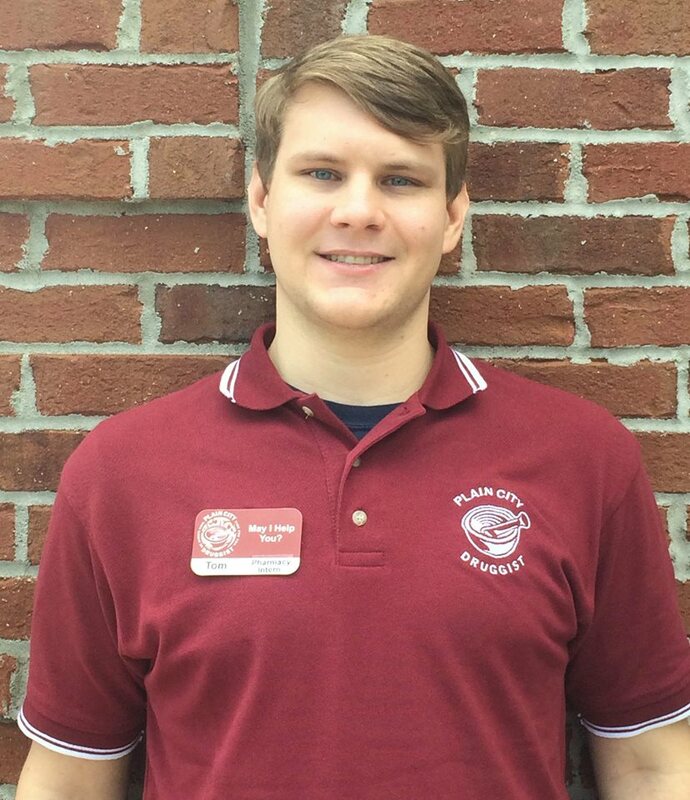 Tom is currently a pharmacy intern with us and is starting Spring Semester of his first year of pharmacy school at Ohio State. Tom grew up in Plain City, where his family still lives. He graduated from Jonathan Alder in 2008, where he played saxophone in the marching band and performed in the Show Choir and musicals. He graduated from The Ohio State University with a Bachelor’s degree in pharmaceutical science in 2012, and from there went into the PhD program in pharmacology at the OSU College of Pharmacy, in pursuit of the research side of pharmacy. He left grad school with his Master’s degree in the summer of 2015 to apply to pharmacy school, having realized he’d rather pursue the more people-focused world of pharmacy practice rather than academic research. He began working for Plain City Druggist in June 2016 and started as a pharmacy student at OSU that fall. Outside of pharmacy, Tom continues to play saxophone, now in the University Band (a concert band for non-music majors) at OSU. He also enjoys playing board games and tabletop role-playing games with friends. Meet Eric Chau, Our Student Pharmacist for January at Karl Road. 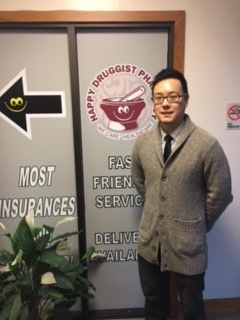 We are so lucky to have a student pharmacist at Happy Druggist on Karl Road this month from The Ohio State University’s College of Pharmacy. Eric Chau is a fourth year student who will graduate in May 2017 and then go on to practice as a pharmacist. In this posting, we’d like to introduce you to Eric. Hello! I am Eric Chau, a fourth-year pharmacy student from The Ohio State University for the month of January. I grew up in South Jersey, near Philadelphia. Most of my Jersey friends are fans of Phillies, Sixers, Flyers, or Eagles. I learned early not to take sides with any sports teams; I watch them all. I do enjoy a Philly Cheesesteak once in a while, “Two whiz wit’,” and an Italian Pork sandwich with broccoli rabe. Yes, I can eat a lot. After graduating from the University of Maryland College Park, I took some time as a research manager at the Johns Hopkins University in the Pulmonary Department. We did all kinds of scientific research: viruses, bacteria, mice, and nanoparticles. I was also involved with clinical trials and budget management. I am fortunate to use my research background in the field of pharmacy. Currently, I am a senior intern at The James Cancer Hospital. This opportunity allows student pharmacists to further understand chemotherapy medications, side effects, and compounding. Because of this experience, I developed a strong interest to become an inpatient clinical pharmacist in the near future. I would like to work in a comprehensive medical center one day, and I am open to any location. Please feel free to stop by and say Hi! I am more than happy to talk to you about medications, food, and life. 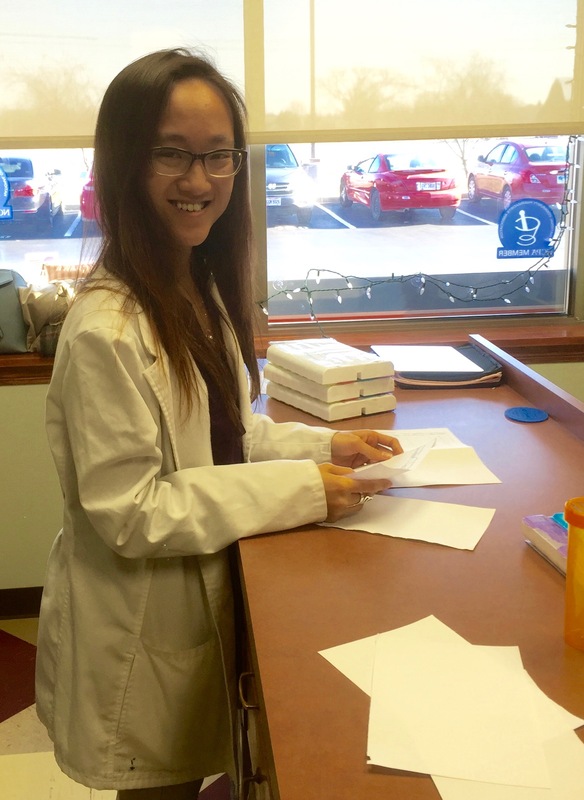 Meet Wendy Lin, an Ohio State Pharmacy Student Who You Will See in the Store. We have a pharmacy student with us off and on for the next week helping with things in the lab and behind the counter. Her name is Wendy Lin and she is a third year student from The Ohio State University’s College of Pharmacy. If you stop in and see Wendy, please make her feel very welcome. My name is Wendy Lin and I am a Class of 2018 PharmD Candidate at The Ohio State University’s College of Pharmacy. I grew up in Canton, Ohio and moved to Columbus, Ohio in 2011 to start my college career. I graduated with a Bachelor’s of Science in Pharmaceutical Sciences in 2014 from The Ohio State University and decided to stay here to complete pharmacy school. I have always wanted a career in which I can help people and have always seen the medical field as the best field for me. I became passionate about pharmacy in high school after having gone through some family medical problems and was fascinated with how certain chemicals can affect the human body to prevent and treat conditions. I volunteered at a local hospital pharmacy in high school and worked for Kroger Pharmacy during undergrad and parts of pharmacy school. Though I loved the community feel and the ability to talk to patients, I left my position at Kroger in December 2015 to focus on a career in hospital pharmacy. I am currently a pharmacy intern at Riverside Methodist Hospital, where I have worked for the last 1.5 years. Currently, I have an interest in ambulatory care, emergency medicine, and psychiatric pharmacy, but am sure that these interests will continue to change throughout my clinical rotations and residencies. I have always loved the small local pharmacy feel, where I can get to know patients personally, so please feel free to stop in and say hi! I look forward to meeting and talking with all of you!